The midterm elections in the US have delivered the House of Representatives to the Democrats. And, across State races, there has been a decided shift left. The results aren’t perfect – the Senate remains in Republican hands. But it’s a landslide 9% nationwide swing against Trump and what he stands for. You won’t hear the truth from conventional sources. The Democrat party representatives will give you the line that it was because Trump is so unpopular. The media will name demographic groups – like educated women and people of colour as constituencies that turned. But the real reason is because the nation got organised into opposing Trump. And one of the major forces behind that organisation is Indivisible. Indivisible started off not as an organisation but as a Google Doc. It was written by a group of former congressional staffers who wanted to do something to channel their anxiety about Trump’s election. It was circulated late 2016 on Twitter and it took off. 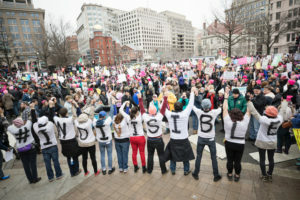 By mid-January 2017 it became an organisation, it grew through the Women’s Marches and by March there were over 6000 indivisible groups across the country. Yes – 6000 groups. These people weren’t traditional political party types, most had never been involved in politics. But their outrage that Trump was President fuelled their entry into activism. They weren’t just wanting to rally, they wanted to take their country back – and that meant getting organised. They were organised very autonomously and very very locally. Unlike traditional political organisations that control everything from the top – this network said as long as you are resisting the Trump agenda you are with us. There was a 23 page Google Document with a bunch of information about tactics that the local groups could try, and off they went. Since then, these groups have worked to save Affordable Healthcare, to help support migrant kids being separated from their parents and in 2018 every single one of these 6000 groups has had a focus on the midterm elections. Taking back the House of Representatives was the first step people could take to resist Trump, on a pathway to toppling him. This movement – focused on its decentralised local power – was in a perfect position to build people power from the ground up all over the country. They had groups in every electoral district – far more powerful than the Tea Party ever was – and they phone banked and canvased, held Town Halls and did outreach all across the year. We can all learn from this movement. In every country where people complain about our politicians we need to remember we have the power to set up alternative movements ourselves. And we will need them. With the surge to the right in Brazil, Hungary and the Philippines, and even just the slide into mediocrity that we see in Australian politics, we need people to get political on their own terms now more than ever. 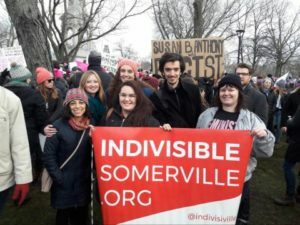 To learn more about Indivisible you can listen to the ChangeMakers Podcast Ep 3, which talks to their leaders and staff about how it works, how it started and how they intervened to try and save affordable healthcare. Listen to the episode on Podcast One, Stitcher or Apple iTunes.